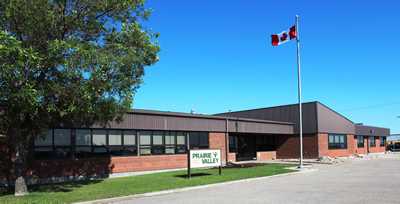 Prairie Valley School Division is one of 28 school divisions in Saskatchewan. It is located in the southeast area of the province and encompasses 27,000 square kilometres, spanning a geographic area from Regina Beach and Bethune to the west, Kelliher and Lipton to the north, Milestone, Sedley and Montmartre to the south and Whitewood and Kennedy-Langbank to the east. Our geography greatly affects our service delivery and cost models. Prairie Valley has 39 schools located in 32 communities. It is unique in that it is entirely rural, consisting of towns, villages, resort villages and rural municipalities, with no urban centre. There are two Hutterite colony schools in the division: Arm River and Lajord. Fifteen First Nations are in close proximity to the division: Piapot, Muscowpetung, Pasqua, Standing Buffalo, Little Black Bear, Okanese, Star Blanket, Peepeekisis, Muskowekwan, Carry-the-Kettle, Sakimay, Cowessess, Kahkewistahaw, Ochapowace and Pheasant Rump. We are a dedicated and energetic team of professionals committed to improving learning opportunities and outcomes for all children and youth. About half of our 1,300 employees are teachers and the other half represent a wide range of occupations including speech language pathologists, social workers, education assistants, occupational therapists, clerical staff, information technology support, caretakers, bus drivers, mechanics, accountants and other staff. We work collectively to make a difference in the lives of our students and provide them with the very best education. At Prairie Valley School Division, we believe in Every Student by Name, by Need because every student is important to us and we provide teachers with the supports they need to make this belief a reality.